According to Victor Cousin, art is for art’s sake. John Ruskin maintained that fine art is that in which the head and the heart of man go together. Both Cousin and Ruskin are essential to understanding Colvin Settinayaka. He calls himself a protest artiste. His exhibition based on protesting was held recently at the Lionel Wendt Art Gallery. Colvin began his career in the weekly Lassana. He later joined the Eththa, the left-oriented daily newspaper of the Communist Party of Sri Lanka as a newspaper artist. His Illustrations were different from the traditional drawings, which marked an identity for himself as an artist. He devoted quite a time in Batik designing too. He became a full-time artist, organizing several one-man exhibitions at home and abroad. His contribution to the children’s book illustrations and book cover designs. He was once awarded a certificate of merit from the Sri Lanka Book Publishers’ Association for the Best Finish Book and the Book Cover. That was in 1984. Colvin is a firm believer in the independence of an artist. The artist must have his integrity. Is it art for art’s sake? I have my doubts! As a social being, an artist must also survive on his own! The Sri Lankan artist’s works of art should go beyond shores. But our cultural authorities offer only a few such opportunities to the local artists. They know no policy to help artists! Artists should be cultural ambassadors to portray the richness of Sri Lankan artist’s paintings! 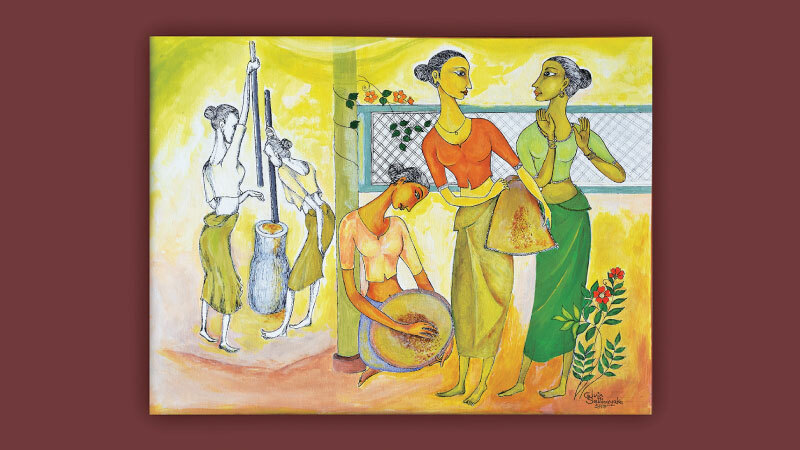 Their paintings portray the Sri Lankan way of living, culture and lifestyles. An artist’s expression may be universal. Even when you view Colvin Settinayaka’s paintings, it’s a portrayal of different thinking. Colvin’s paintings depict poverty, social injustice, inhumanity etc. Colvin’s expressions are rooted in the Sri Lankan soil. Colvin’s use of colours is vivid. His thinking and expressions is a powerful combination of colours and rhythms. The simple man, small-made, is a protest artist on a large scale! He is a firm believer that people should be the priority in every social activity. They are the suffering masses! Day by day their living standards are dropping down! Every art form should be a portrayal of human nature. Poverty, Diseases, disabilities, blindness and deafness all these complexities prevail in every human society all over the world. Any artist in any medium of expression has to focus on them, Colvin emphasises!